In many countries, an essential part of the beer experience is to “use” the drink, as the Victorians would have put it, in summer. “I like beer in the summer”, the old left-handed compliment, is an idea not quite past its due-date. That is, while beer is an all-season matter for those dedicated to the malty way, many still associate the drink with summer and the outdoors, especially baseball and barbecues. And in truth, a cold one in hot summertime has an undeniable charm – that is if actually consumed outdoors at an event such as mentioned or in your own backyard. Enter, A/C. I think it was in Commentary magazine recently that an economist, using an arresting image, said he asked his mom who lived in Florida how much money she would accept to give up A/C. He said, would you take $9,000,000? She said no. He was explaining that in measuring the successes of the modern economy, one shouldn’t look at it strictly in linear, wealth-accumulation terms – some achievements have a worth hard to estimate in money. A/C in North America and many parts of the world is an example, the Internet is another example that occurs to me. No one can gainsay the importance of A/C. In my own lifetime I recall working in hot offices indoors when we relied on windows for airflow and fans were used to move air inside. The same applied at home, where people sat outdoors more in the evening. Somehow we survived it, and of course people still do in many parts of the world where the climate is much hotter than ours and A/C is absent or a luxury. So is there a downside to A/C, setting side the energy cost and that part of the equation? I would say yes, it has lessened the beer experience. Beer tastes best in the open air, which is why Germans invented the beer garden and the English lounge outside the pub, or in a yard behind, to sip their pint. There is a natural affinity between a cool beer and sunshine or a natural breeze. There is something, well, not wrong, but inapposite, about drinking a fine beer with the wind of A/C on your neck when it is 80 F outside, breezy and glorious. 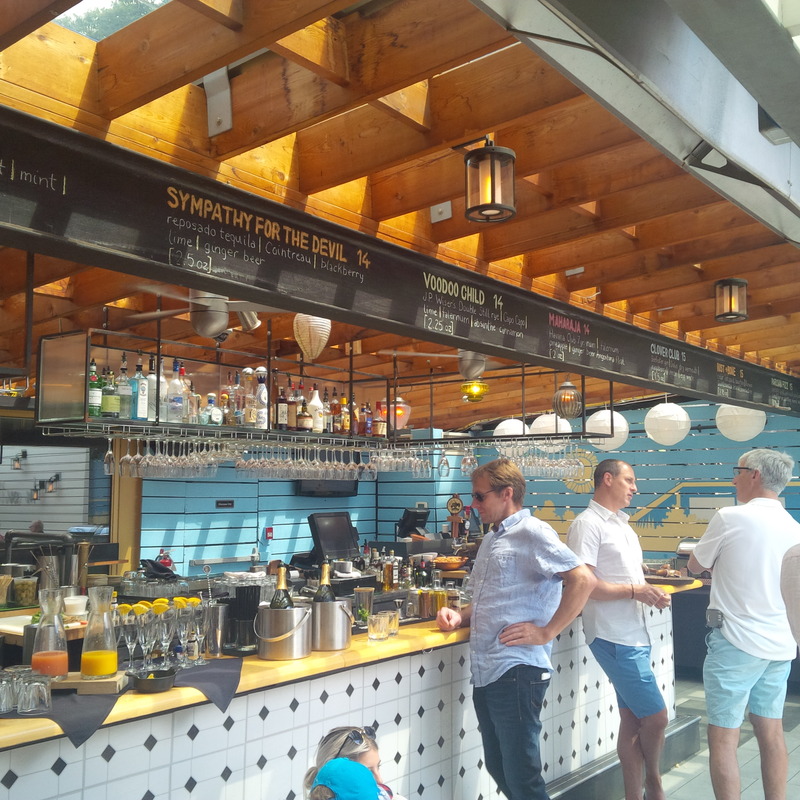 To be sure, at 90 F + and with no shade, many will prefer the dank interior of an air-conditioned bar or restaurant. But at least in our climate, the norm is for less intense Hades than that. Still, most will go indoors where it is colder. It becomes a habit, but the beer won’t taste as good. (The flip side is drinking beer ice-cold when it is freezing outside in January, but people still do that too). Nonetheless, some bar-restaurants have a roof deck or patio and if the weather is just right, you will find people there enjoying a drink. There are fewer than before, in part because you can’t smoke in Toronto in those areas now. Last night I met some friends after work for a drink. 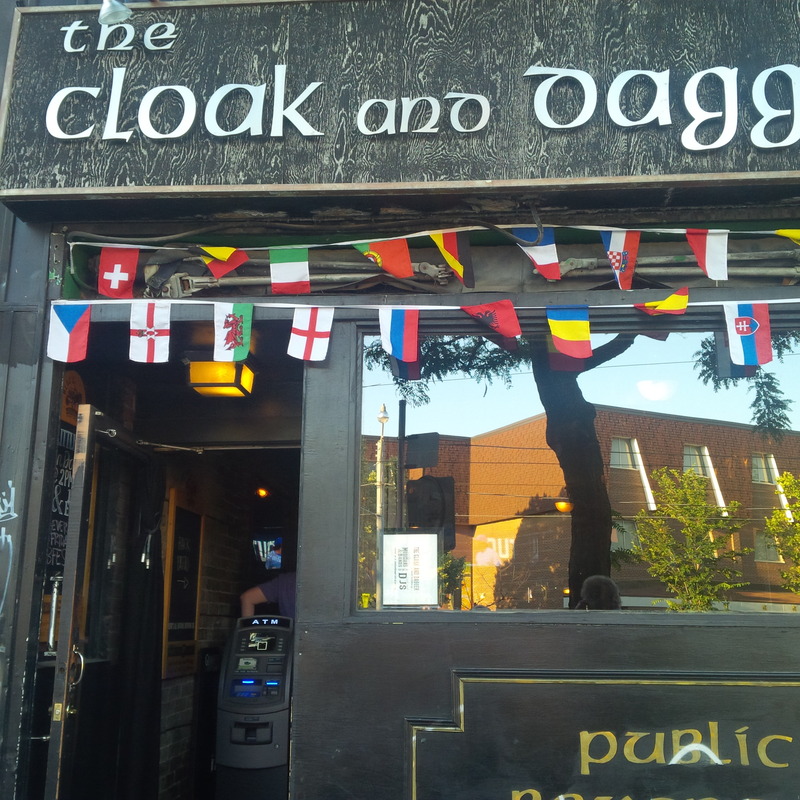 We met at an off-piste place, Cloak and Dagger, on College Street near Bathurst. By the name and fascia it looks like an Irish or U.K.-type pub. It isn’t though, it is a small dark room with wooden banquette seating which must be generations old. The bar is in the back and has an excellent craft beer choice, usually with a cask ale on offer. 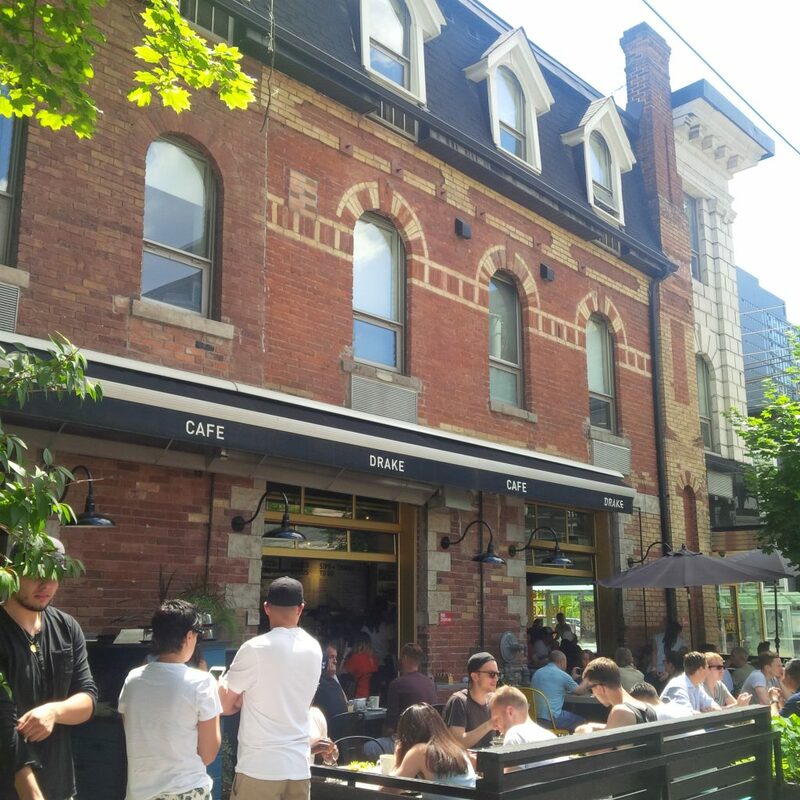 It attracts a neighbourhood crowd, many from Kensington Market, and has a bohemian feel to it. The Cloak has a very pleasant yard in the back surrounded by high brick walls of various faded hues and foliage covers a good part of the murs. If one of the surrounding roofs had a chimney-pot or two you would think you were in England, given too the wood trestle tables and the pint glasses of brown stuff on the tables. It’s a quiet escape for an hour and is rarely crowded, a plus when the weather is at its best here. Last night, it had cooled somewhat by 7:00 p.m. but apart from our group only a couple lounged outside, most of the customers preferred the air-conditioned interior. Another example of outdoor drinking, in another part of town, is at the Drake Hotel and a scene is shown of my recent visit there. It’s the rooftop bar during a brunch there this past Sunday. The other scene is the patio area along the hotel north from Queen Street. The Drake is one of Toronto’s great restorations, it’s an old commercial travellers hotel (near a former railway junction) which was restored 12 years ago retaining many of the original fittings. It looks like some of the old provincial hotels in England and the surrounding area also has an early suburban English look. You see that a lot in Toronto, the parts which survive the developers’ gaze. I totally agree, Gary. Drinking beer outdoors in warm weather is a special treat, and far superior to sitting in an air-conditioned space. Thanks Jan, nice to hear from you. Readers should be aware of Jan’s excellent restaurant history site: https://restaurant-ingthroughhistory.com/ and her related work on the social history of consumerism.